Blog: Rabbit, Rabbit – January 2013 Blog: What’s a Workflow? pixels2Pages™ LIVE Events are weekend-Long events hosted and sponsored by FOREVER™ Ambassadors. At a pixels2Pages LIVE Event, the sponsoring/host Ambassador customizes the event to suit the customers and sometimes the location of the event. Every pixels2Pages LIVE Event will be different. 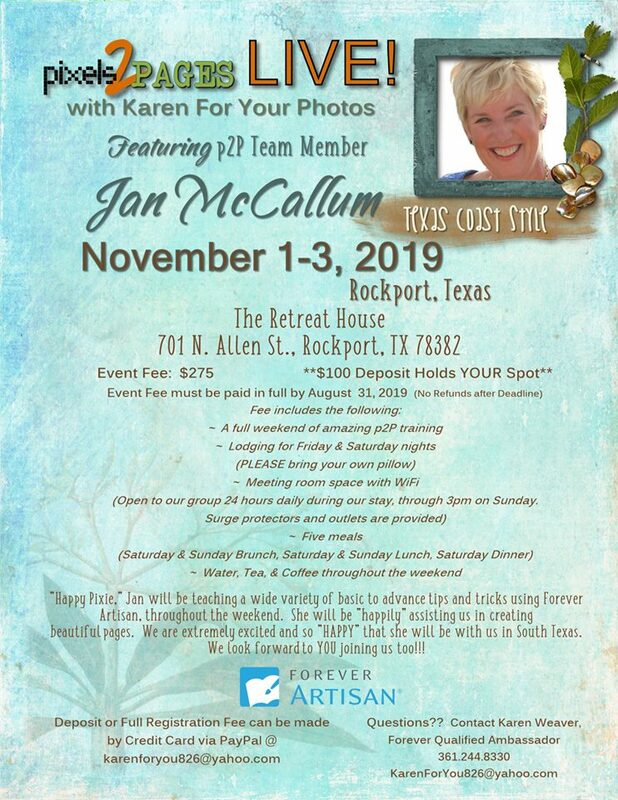 The sponsoring/host Ambassador is there to provide you with all of your FOREVER needs while a FOREVER pixels2Pages team member is on hand to provide you with the training, inspiration and one-on-one assistance for FOREVER Artisan and Historian. Bring pixels2Pages training to your personal event. The Pixies are pros at developing lesson plans and challenges, and can be hired to present at your event(s). Send an email to info@pixels2pages.net for details. The pixels2Pages Team is currently planing a p2P LIVE Birthday Bash. Location and details are soon to come. Note: p2P LIVE New Orleans which was tentative for Fall 2019 is postponed until further notice. p2P LIVE! events are coordinated and sponsored by local Ambassadors and hosts, and space is generally limited. Click on the links above for more information about the event. If the event is not linked, registration has not yet opened or registration has closed. If you are interested in hosting an event, or have questions about any of the events listed above, send an email to info@forever.com. We will then connect you with the Trainer nearest you. I am thinking of hosting a P2P event in the NW Austin area, close to Lakeway, TX. Do you know if there is any interest from people who live in central TX and would be interested in attending? Or do we just have to put the info out on this site and see what happens? Do you guide us in how to coordinate such an event? Hey Toni – that sounds great! I will email you details. I am in San Antonio and would be interested! Will there be a crop in Chesterfield, CT in October 2019? Yes there is. Our schedule will be updated on March 1st. Interested in attending the Raleigh event March 29. My parents are moving into a retirement home sometime in March. If I’m needed that same weekend to help them can I get refunded? Lisa, sure hope you can come! Please check with Elizabeth Goodson, the event coordinator. Her contact info is on the bottom of the registration page (link to it is in this post). Hi! Thanks for making my event next March in Morgan Hill available for everyone who is interested. Please note, the link on the page gets a “404 error.” Let me know if you need another copy of my registration/information form. Thank you for bringing this to our attention. It is fixed now. I am interested in the June Birmingham event. Can you please put me in contact with Fran? Do you ever hold events in the Midwest? We train at any location where we are hired to serve as trainers. pixels2Pages does not organize the events – individual Ambassadors or customers do. Please contact us at info@pixels2Pages.net if you’d like more information about how to do that. I am interested in the Morgan Hill events. Kim, would you send me information? Thank you! Tameka, I am interested in the Birmingham, AL June live retreat. Can you please get me in contact with the Ambassador. Thanks! I sent her your email. why is the Atlanta area P2P Live a private event. Is it not open to those of us who have gone before? Who is in charge of the March event? The Atlanta even is marked private as the Host’s customers get first choice at registration. If seats open closer to the event, they will be opened to those on the wait list. who is the host. THere are several of us in Atlanta area that attended your prior event in Gwinnett but I thought being an ex consultant for CM that we would have been in the loop. Donna Gibbs is the host, but she has a pretty large customer base and opens only to her customers first. If seats open up, they become available to the public. The last event did sell out with her customers. Hi Amanda, as soon as the hosts have their flyers ready, I’ll let you know. I sent you an email with the host information. They are still working on registration. I live in San Antonio and see an event in Austin on June 8th and 9th. Is there any way to get additional information on this event? I would love to find digital scrap bookers nearby! Mary Ann, This is an event booked by an ambassador and is full. I live in Pflugerville and am looking for someone in my area to help me learn all of this. I stepped away for a while due to Life Happening and am getting back to it slowly.. Does anyone have a name of someone in my area that does Digital Scrapping? Hello Mary Anne. We recommend you go to the FOREVER Site and search for an Ambassador. How do we get a hold of our ambassador? I want to know about the Broken Arrow event. I went to the website and put Lisa as my ambassador, but don’t know how I can reach her. I have emailed the Ambassador with your information and have asked here to reach out to you. Our NYC Live! was everything I expected and so much more. My brain was filled with creative ideas and (now it is post-Friday) and I am still thinking about what I learned! I can’t even tell you how wonderful I think this training is. I hope to attend at least one Event a year to keep me fresh and creative. I have always been a big cheerleader for you guys. You all are the absolute bomb! The P2pLIVE events rock! When I think of the money I spend on software, embellishments, kits, & albums my P2P membership and the LIVE event are the best investment I can make in my scrapbooking hobby. So many great techniques – totally priceless. Tameka is a patient and knowledgeable instructor. I can’t wait for my next LIVE event! Thanks, Jan, I think I’m all set. Can’t wait! On September 12th, I registered for the upcoming P2P Live event in Morgan Hill, CA. Should I have received anything in the way of confirmation by now? I have tried emailing you at info@pixels2Pages.net twice now but the email has bounced back. Thank you! Clare, you are registered for the LIVE event. If you check your membership details, you’ll see that you are a member of the Morgan Hill group. Is there something more you need to know or check on? I’m not sure why your recent emails have bounced back; I have other emails from you to that address. If you’ll try sending a test email I’ll respond back when I get it. I know Kim is looking forward to seeing you in a few weeks! Loved, loved, loved the weekend. Jan, Mary and Justine, you have a wonderful way of teaching old dogs to learn new tricks. I gathered so much information during the weekend. For any of you who are wondering if you should attend a p2P LIVE, sign up now for the one closest to you. You won’t regret it, I guarantee! You owe it to yourself to spend some time away from everything (I know that your cellphone will be at hand) to learn how to enhance your digital photos. It’s a wonderful, relaxing, fun time while learning how to ‘get ‘er done’!!! Thanks, Gerry!! We had a fantastic time! Would you do us a huge favor and fill out this evaluation form? We would appreciate it! This was the best weekend ever! Thank you Jan, Mary and Justine for teaching the 5 ways of Dates, Collage, Journaling and Monograms! You’re all the best!